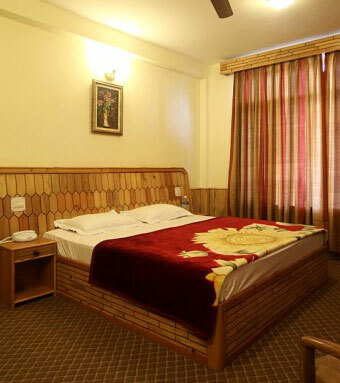 Accommodation: Hotel Holiday Cottages Manali is 3 star hotel in Manali sharing its nearness to the river side and a stone’s throw away from the hill station’s bus stand. You can view the tremendous image of snow-capped mountains and lush green foliage around. Moreover, these cozy cottages are filled with most modern room amenities and the spirited ambiance of this resort makes the entire stay of the guests very cheerful and peaceful. Additionally, Hotel Cottages provides its 18 decently established cottages, divided into following categories such as Deluxe Cottage, Super Deluxe Cottage, Royal Cottage. Exclusive Cottage and Super Exclusive Cottage and allows the lodger to pick and choose any cottage based on his liking and preference. Dining Facilities: Hotel Holiday Cottages Manali does have a multi-cuisine bistro where the chefs of the hotel prepared scrumptious delicacies which will perfectly suit your taste buds. Business Facilities: If you are coming to Manali with some business venture in hand then please note that this 3 star cottage of Manali in Himachal Pradesh will be a class choice. It is so because it has an airy business hall which is outfitted with latest business gadgets and gizmos plus the additional support of the travel desk that works 24-hrs will also let your business deal take place in a victorious manner. Recreational Facilities: Billiards& Snooker, café, chess, gym, shopping walkway, steam room, bar service, games room, Jacuzzi, meditation & yoga, sauna, spa, water sports, badminton, basket ball, cycling, golf, nature walk, and tennis court are some really superb yet entertaining facilities provided by this Manali hotel. Other Facilities: Caretaker, baby care facility, airport/railway station transfer, wheelchair on request, electronic safe, fireguards, generator, acceptance of all major credit card, money changing facility, personalized services, medical assistance, car rental service, shuttle service, travel and tour counter, travel guide, car parking, reception, etc.